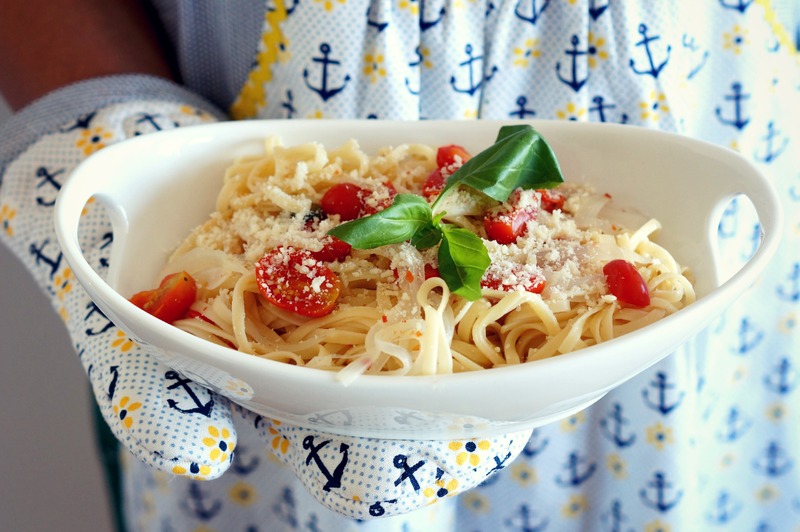 I did this post mainly to show off the adorable new apron and oven mitt that I picked up on sale at Anthropologie… but I gotta admit the pasta’s pretty darned tasty too. The best part is that you can just throw everything into a single pot and have something truly delicious emerge just 10 minutes later. Try it out and let me know what you think! 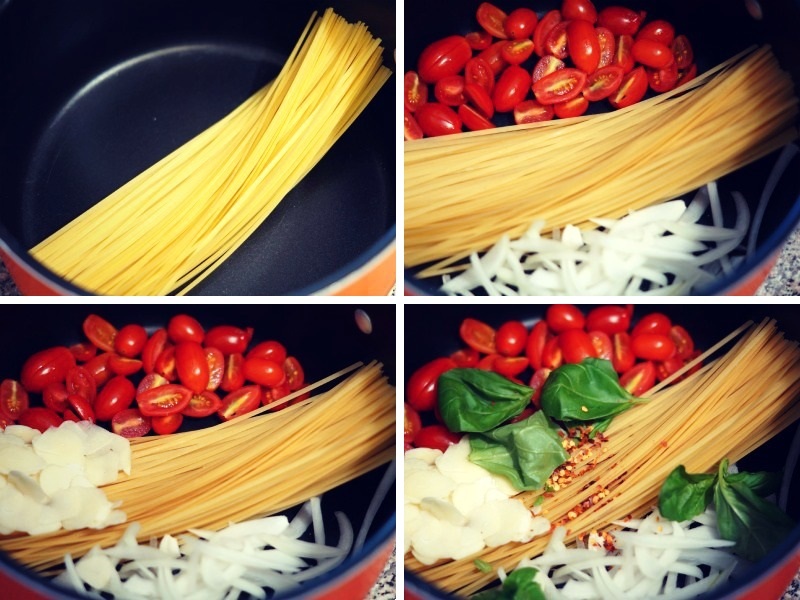 Place the pasta in a pot. Slice tomatoes in half and drop in the pot, along with your onions, garlic, basil, red pepper and kosher salt. Cook pasta until al dente, about 7 minutes or so. Be careful not to overcook, or you’re pasta will come out mushy. 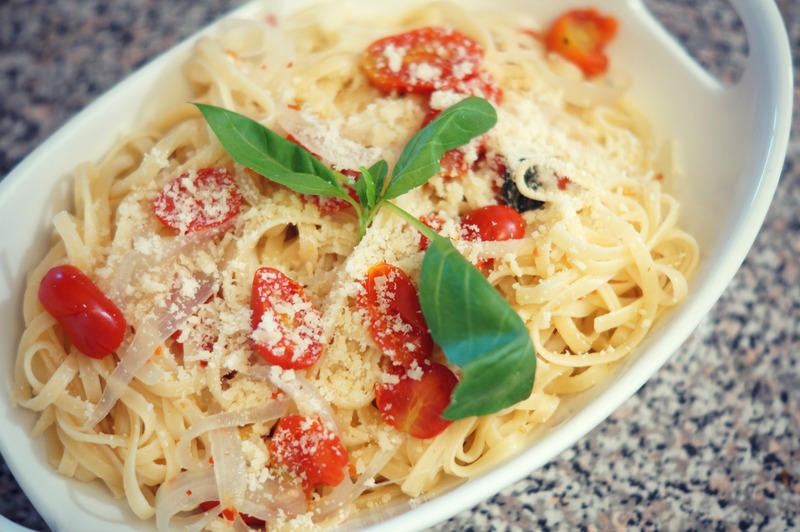 Drain pasta, and toss with parmesan cheese and a litle olive oil. Add salt and pepper to taste, and sprinkle with parmesan cheese and parsley before serving. I’ve served this dish with some leftover meatballs for a hearty weeknight dinner, but next time I may try dropping in a few shrimp for a true one pot pasta meal.